With his trademark howling Hammond, James Taylor has a reputation as a solid and accomplished band leader. The Theme from Starsky and Hutch, cemented the band's reputation as masters of the jazz-funk-r'n'b workout. Formed in 1985, JTQ began playing music similar to the rare-groove jazz-funk then in vogue around London. By the early 90s, that movement had spawned acid jazz, and JTQ found itself at the forefront of a vibrant young club scene. "In The Hand of The Inevitable" remains Acid Jazz's biggest selling album to date. JTQ's "Whole Lotta Live" album was nominated for a MOBO award in 1998. Other career highlights to date include contributions to albums by Tom Jones, The Wonderstuff, Manic Street Preachers, The Pogues and U2, not to mention scoring the theme tune to "Austin Powers: International Man of Mystery"! 2007 saw the release of "Don't Mess With Mr T: James Taylor Quartet Plays Motown" on Dome Records, featuring guest lead vocalists Omar, Hil St Soul, and Donna Gardier. Also, a new outfit, James Taylor's 4th Dimension, released "Picking Up Where We Left Off" in 2007, and JTQ was nominated in the Ronnie Scott's Jazz Awards. JTQ's "A Taste of Cherry" was released in September 2006. 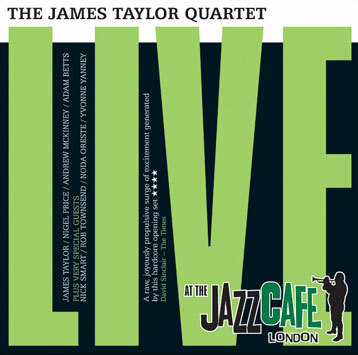 This 11 tune collection was recorded live at London's Jazz Café in December last year.